Among the many implications of the coming Democratic takeover of the House in January will be an altered debate on the long-controversial Consumer Financial Protection Bureau. Rep. Maxine Waters, D-Calif., the likely chairwoman of the Financial Services Committee, has promised a special focus on protecting the bureau that many Republicans want to vitiate. She would likely revive a bill she introduced in September that singles out acting CFPB Director Mick Mulvaney by name, calling his appointment illegal and his policies counter to the charter of the agency set up by the 2010 Dodd Frank Financial Reform Act. “I will prioritize protecting consumers and investors from abusive financial practices, making sure that there are strong safeguards in place to prevent another financial crisis,” Water wrote in a Nov. 9 letter to colleagues seeking support for her becoming the first female chair of the panel. “During the past six years, I have been on the front lines of pushing back against a rigid Republican ideology set on rolling back Wall Street reform and pursuing an anti-consumer, anti-investor, and anti low- and moderate-income family agenda,” she said. The Democrats, however, will still have to contend with a White House and Office of Management and Budget (which Mulvaney runs simultaneously with CFPB) that views the bureau through the lens of its deregulatory goals. And they will still work opposite a Republican-controlled Senate, which is likely to vote in the next two weeks on Trump’s nominee, White House homeland security specialist Kathy Kraninger, to replace Mulvaney as permanent CFPB chief. The bill also demands release of documents related to Mulvaney’s reorganization of the student loan operations that prompted the resignation of a key bureau official in August. Waters’ larger agenda was characterized as reasonably bipartisan by the Independent Bankers of America, which expects Republicans to pick Rep. Patrick McHenry of North Carolina or Rep. Blaine Luetkemeyer of Missouri as the panel’s ranking member. 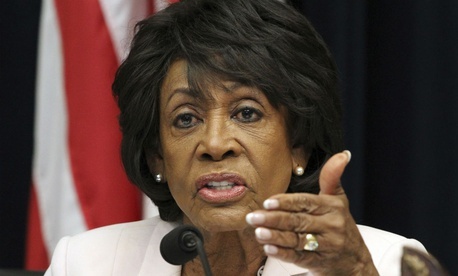 “Expect Chairman Waters to focus on criticism of the largest banks and Wall Street firms as well as scrutiny of Bureau of Consumer Financial Protection rules, enforcement, and administration,” the group wrote after Election Day, using Mulvaney’s name for the bureau that is based on the statute’s exact language. Consumer advocates see the Democrats new powers of oversight as “the strongest tool in the tool kit,” Lisa Gilbert, vice president of legislative affairs at Public Citizen, told Government Executive. “Things are not going according to the mandate of Dodd-Frank, and we hope Waters will use her powers to call in Mulvaney and the new political appointees at the CFPB,” she said. They should be asked about “stalled rulemakings, lack of enforcement and reorganization that’s counter to the mandate of protecting consumers. We hope it all deserves scrutiny, and hope she shines a light on the need to reverse course,” Gilbert added. Carter Dougherty, a spokesman for the nonprofit coalition Americans for Financial Reform, said, "With CFPB embracing payday lenders and doing favors for big banks, effective oversight will help make clear that Mick Mulvaney has turned the agency that is supposed to look out for consumers into an ally of the industry. A very public examination of what is being done to the agency that is supposed to defend ordinary Americans from Wall Street's bad practices can only be a good thing." Liberal groups backing the bureau also point to polls and election results that they believe show that Republican efforts to revamp the bureau are unpopular. The Nov. 6 elections “proved to be a triumph for consumers,” said Allied Progress executive director Karl Frisch. “Democratic challengers in moderate-to-conservative districts won by distancing themselves from Wall Street and financial industry special interests, vowing to protect the Consumer Financial Protection Bureau, and calling out predatory lenders,” he said in a Nov. 14 statement. “Conversely, Democratic senators who lost were those who joined Republicans in deregulating the banking industry and reversing consumer and market protections. Bottom line—voters respect Democrats who fight for consumer protections and financial industry accountability." A poll taken last summer by Americans for Financial Reform and the Center for Responsible Lending showed that “voters of all political parties overwhelmingly oppose the actions taken by Mick Mulvaney to undermine the mission of the Consumer Financial Protection Bureau and feel a strong connection between lax enforcement of the rules on Wall Street and their daily welfare,” the groups said. The bureau itself, meanwhile, has downplayed some of the controversy while taking actions that its managers believe strongly police financial industry bad practices. On Tuesday, it announced a settlement with the Dallas, Texas, consumer financial services company Santander Consumer USA. The company “violated the Consumer Financial Protection Act of 2010 by not properly describing the benefits and limitations of its S-GUARD GAP product, which it offered as an add-on to its auto loan products,” the bureau said in a release. Under the terms of the consent order, Santander must provide about $9.29 million in restitution to certain consumers who purchased the add-on product, clearly and prominently disclose the terms of its loan extensions and the add-on product, and pay a $2.5 million civil penalty.